The wind farm extension is to comprise of 16no. turbines, a meteorological mast, new and upgraded forest tracks and a substation. A large borrow pit and a temporary works compound will be in use during the construction period. The investigation was undertaken between Nov. 2009 and Feb. 2010 on land between 1,500m AOD to 2,000m AOD during one of the worst Scottish Winters for 50 years. Tree felling was undertaken over parts of the site so that access could be gained into all of the areas to be investigated; geophysics was also completed over areas of deep peat to determine whether underground caverns/streams were present. 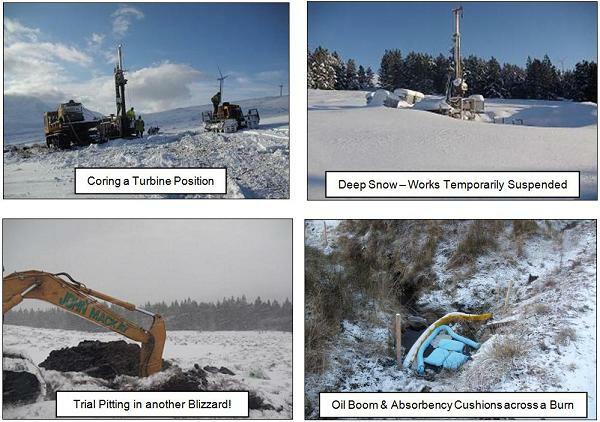 Intrusive site investigation works included rotary coring (turbine, met. mast and borrow pit positions), in-situ testing (SPTs and plate load tests) and trial pitting. The site investigation works were successfully completed despite the difficult terrain (steeply sloping, deep hags within the peat, deep snow, tree stumps/brash/logs, and soft ground). To aid mobility across the soft ground (deep snow/peat): low bearing pressure tracked plant was used (dumper, muskegs, rigs and excavator); one of the rigs was mounted on a sled; wheeled vehicles utilised snow chains; and, snow shoes were worn by site operatives. Of concern during the site investigation works was the pollution of the nearby pristine Loch Glass by hydrocarbons (from spillages during refuelling, hydraulic hose pipe bursts etc.) and sediment finding their way into one of the burns flowing rapidly down off the hill. Prior to any works being undertaken, silt traps were constructed and oil booms installed at various elevations along each burn which could have potentially been affected. All pollution prevention works were completed to the satisfaction of Scottish Water. No significant pollution incidents occurred during the site investigation. Developments on this site are to include 18no. wind turbines, 2no. meteorological masts, a substation, a temporary construction compound, a large borrow pit, and approximately 12km of new access tracks. Following the detailed study of geology maps and memoirs, potential development constraints on this site included the potential for numerous mine shafts/bell pits and shallow coal workings close to the outcrop of two coal seams which trended close to several of the turbine positions. 1) The use of geophysics to determine whether bell pits/mine shafts were present beneath proposed developments in the vicinity of the coal seams. 2) The excavation of 178no. trial pits. Soils and rock recovered from each pit was logged in detail (to BS5930) and sampled. CBR/plate load testing was undertaken in 30no. of the trial pits for road pavement design purposes. In-situ shear vane testing was undertaken in all of the trial pits. 3) The formation of 21no. rotary holes beneath the turbines, meteorological mast and substation. These were to check for the presence of mining related voids and voids related to the dissolution of limestone. Voids within bands of limestone were an unexpected finding (given information from the geological map/memoir study) within several of the turbine rotary holes. 4) The formation of 2no. rotary cored holes over the borrow pit area. 5) The detailed logging of approximately 350m of rock core. 6) Gas and ground water level monitoring. 7) Soils and rock laboratory testing. 8) The completion of a topographic survey around the substation and works compound area. 9) Site investigation works at several water pipeline proposed track crossing points. Large amounts of artesian water (under considerable pressure) were encountered in some of the rotary holes formed and this had to be sealed to prevent local flooding of the site. Upon completion of the site works, gas monitoring and laboratory testing TLC produced a factual and interpretive report giving advice on: allowable bearing pressures, likely founding depths and possible foundation solutions for the turbines, meteorological masts and substation; groundwater control; treating underground voids within limestone; ground gases; road pavement and concrete design; and, whether the rock within the borrow pit area was suitable to be used as structural fill and to stone up the proposed track ways. Developments of this site are to include 12no. turbines, 2no. meteorological masts, 2no. borrow pits, new access tracks (including 3no. pipeline crossings), a temporary construction compound and a substation. Prior to any site investigation works being undertaken, as approximately a third of the wind farm was taken up by a mature coniferous forest, forested areas coincident with proposed developments had to be cleared so that the site investigation plant could obtain access into these areas. The site works were delayed slightly in the forested area due to the presence of a buzzard’s nest. In addition, the entire development area had to be scanned for unexploded ordnance (arranged by TLC) as parts of the site had been used for military practice during WWII. TLC had to work closely with an ecologist from White Young Green to ensure that site investigation equipment/personnel stayed well away from several ecologically sensitive areas within the site boundary. The site works involved the excavation of 110no. trial pits, 10no. rotary cored holes, in-situ CBR and plate load testing, and soils and rock core logging. Representatives from BP and Shell were in attendance (organised by The Land Consultancy Limited) during trial pit excavations close to the pipelines (BP Forties and Shell Flags). Upon completion of the site works TLC produced a factual and interpretive report giving advice on: allowable bearing pressures, likely founding depths and possible foundation solutions; concrete and road pavement design; whether the rock within the borrow pit areas was suitable for use as structural fill and on the proposed track ways; and, measures to protect the pipelines at the track crossing points.